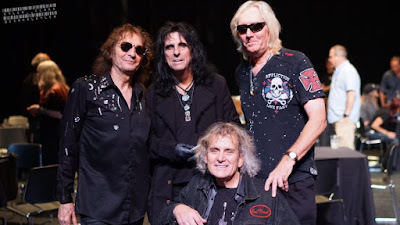 Alice Cooper reunited with his original 70s bandmates Michael Bruce, Dennis Dunaway and Neal Smith in Nashville, TN on May 14 and video from the show has surfaced. The three appeared with Cooper for the encores at the Tennessee Performing Arts Center's Andrew Jackson Hall, delivering “I’m Eighteen,” “Billion Dollar Babies,” No More Mr. Nice Guy” and “Muscle Of Love” before being joined by the rest of Alice's current band – guitarists Ryan Roxie and Tommy Henriksen, bassist Chuck Garric and drummer Glen Sobel – for the finale of "School's Out." Guitarist Bruce, bassist Dunaway, drummer Smith and lead guitarist Glenn Buxton were the original lineup for the Alice Cooper Band from the mid-sixties to 1975, recording seven albums of classic tracks before the singer launched a solo career with “Welcome To My Nightmare.” Buxton died of complications from pneumonia in 1997 at the age of 49. The three surviving members will be featured on Cooper’s forthcoming album, “Paranormal”: they’ll appear on a special three-song bonus disc with the project when it’s released on July 28. The set also includes appearances by U2 drummer Larry Mullen Jr., ZZ Top's Billy Gibbons and Deep Purple bassist Roger Glover. The Nashville appearance is part of Cooper’s current spring tour of North America, which runs to the end of June before the rocker heads to Europe for a five-week stint. Cooper will team up with Deep Purple for a late summer run across North America starting in Las Vegas, NV on August 12.